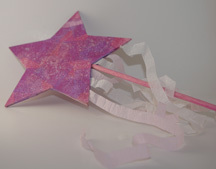 Here’s a beautiful fairy wand craft that can also be made with boys using non-pastel tissue paper as a star-topped magic wand. Perfect for Harry Potter time! What You Need: two cardboard stars (trace free printable template provided here); chipboard or thin cardboard; scissors; scraps of pink, dark pink and white tissue paper; white and pink crepe paper; white or silver glitter; white glue; thin wooden dowel; pink acrylic or tempera paint. How You Make It: Paint dowel pink and let dry. Trace stars onto chipboard twice and cut out. Cut thin strips of crepe paper. Spread glue all over one side of each star and glue crepe paper to bottom edge of one star. Press both stars together with dowel in the middle and let dry (help preschooler hold together until secure or place under heavy object). Glue tissue paper pieces all over the star. Cover with layer of glue, like a decoupage project. Sprinkle glitter over still-wet glue. Let dry. Ta-da! It’s like magic. This entry was posted on Monday, July 30th, 2007 at 5:20 am	and is filed under fairy crafts, tissue paper crafts. You can follow any responses to this entry through the RSS 2.0 feed. Responses are currently closed, but you can trackback from your own site.